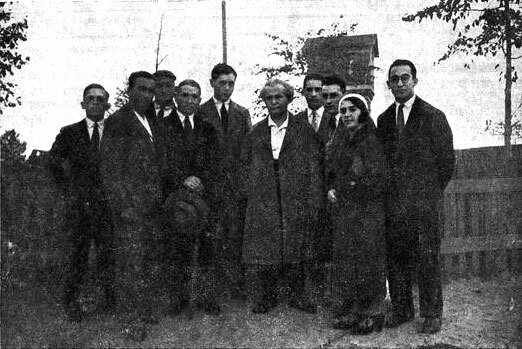 David Ben-Gurion (Grün) (center) during his visit to Płońsk in 1932 with members of the "League for Eretz Israel"
David Ben-Gurion was born in Płońsk in 1886 as David Grün. 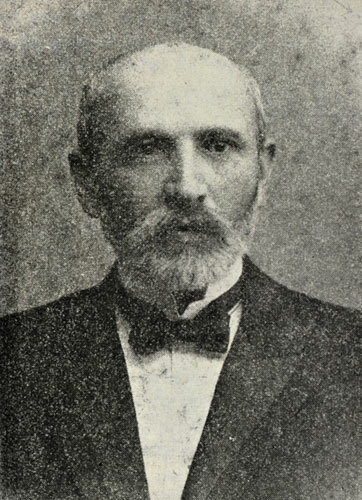 His father, Avigdor Grün, instilled in David a love of Zionism. 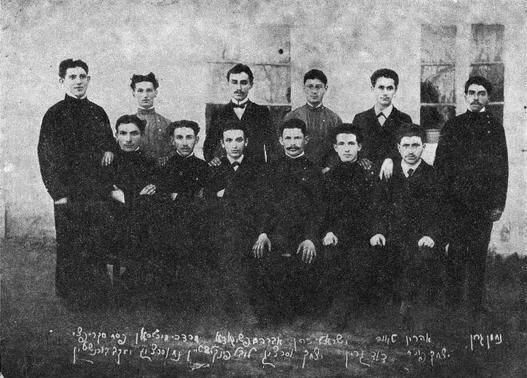 In 1900, Ben-Gurion established the Zionist "Ezra" organization in Płońsk, named for Ezra the Scribe, in order to study the Hebrew language and its heritage. "Shlomo Zemach and I would gather the youth at the synagogue, between Mincha and Ma'ariv, and teach them advanced Hebrew language skills. Over time we managed to persuade the older people to speak Hebrew, by answering them and engaging them in conversation in Hebrew. And there was another very unusual thing: the municipality spoke Hebrew" (Ben-Gurion, Beit Avi (My Father's House), Hakibbutz Hameuchad, 1966). 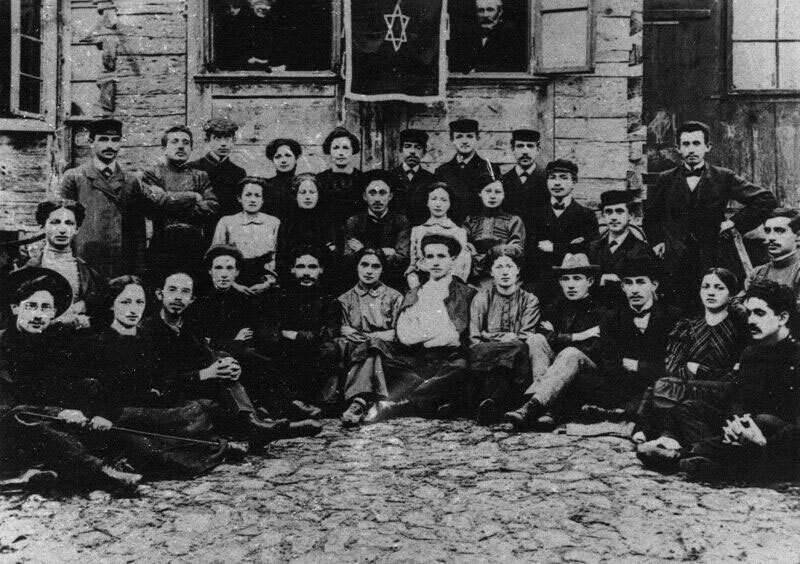 The "Ezra" youth were among the founders of the "Poalei Tzion" party in Poland. Ben-Gurion was a founder of the branch in Płońsk. Bund emissaries to Płońsk had an argument with the "Poalei Tzion" representative in the city synagogue. "The Bund sent the best of its speakers from the surrounding cities to storm Płońsk," wrote Ben-Gurion, "and at the Great Synagogue there were public disputes between me and the Bund emissaries. The whole city got heartily involved in the polemic. Aside from the traditions of enlightenment, the Hebrew language and Zionism, a 'local-patriotism' was active here: I, who fought against the Bund, was a local boy, and the Bund emissaries were strangers. There were times when they would close the stores during the debates, and the whole city would come to the synagogue." "The Bund emissary would appear at the Płońsk Synagogue, wearing a pistol and accompanied by two bodyguards. Opposite him, David Grün would get up on the stage. In a dramatic, tense atmosphere, they would look at each other; silence filled the synagogue and the verbal duel would begin. After a few days, David Grün… halted the Bund attack on Płońsk and restored 'Poalei Tzion' as the main stream among the youth of the city" (Michael Ben Zohar, Ben-Gurion, Am Oved, 1975, p. 41). "Together they [David Ben-Gurion and Rachel Nelkin] emigrated to Eretz Israel. They sat next to each other with their friends, who had come to say goodbye to them, in the yard of Avigdor Grün, their arms crossed over their chests, their expressions joyful and serious, she in a long dress with an embroidered collar and he in a white rubashka shirt, peaked cap and black boots. Above the friends that had gathered around them, Avigdor Grün looked into the camera from the open window of the house, and next to him flew a "Poalei Tzion" flag. Together, David and Rachel and their friends stood up and faced east. They sang, as was 'Poalei Tzion' tradition, the 'Song of the Oath'" (Michael Ben Zohar, Ben Gurion, p. 43). "He instilled in me a love of the People of Israel, the Land, the Hebrew language. In our small house in Płońsk, on the edge of the city, next to the abandoned park, near the garden of the Polish priest, when I was a child, the Hovevei Zion in our city would gather, and as Herzl's Zionist movement came into existence, our house became the meeting place for the city's Zionists. While I did not yet understand the content of the discussions and the debates, I absorbed into my very being the Zionist hope that filled the void of our home, during the weekly gatherings and the daily meetings of the important businessmen, Simcha Isaac, [Mordechai] Yishpe, the shochet (ritual slaughterer) and others, at the head of whom stood my father" (Sefer Płońsk, p. 41). "After Kishinev, we, the youth of Płońsk, secretly organized a self-defense group and acquired weapons, and I headed the organization and hid those weapons in our house – my father knew about it and didn't question me, even though he knew very well the danger he faced to himself and his position in the city if it were to have been discovered. On the contrary, he was proud of the fact that his son was taking care of it… my decision to emigrate to Eretz Israel in order to be active there was a great disappointment to him, because he had hoped I would become a renowned scholar, but he did not question me; to the contrary, he gave me the resources to emigrate and organized my trip for me. The letters he received from me from Eretz Israel were extremely precious to him – all the city would come to read them, and he protected them with great love. "… so we fulfilled his life's dream… to emigrate to Eretz Israel, him and all his family. 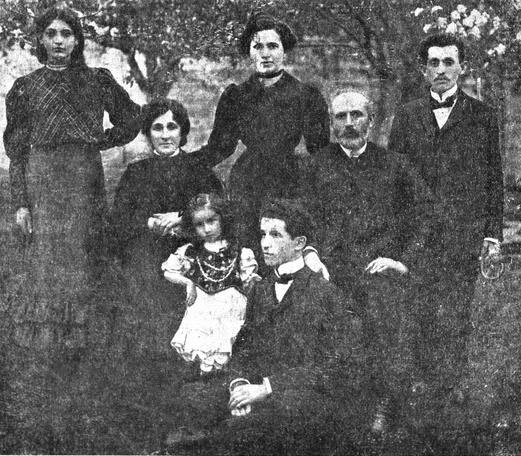 But meanwhile, WWI broke out… many of our relatives were scattered across Russia – because of the deportations and hardships of the war – and only afterwards [in 1925] did his life's dream come true, and he, and all his children afterwards, emigrated one by one to Eretz Israel" (Ben Gurion, Avi).